Normally more than 200 people in Northumberland complete an apprenticeship related to construction, planning or the built environment each year. That’s around 1.2% of all such apprenticeships in England. Not bad, considering that Northumberland represents just 0.6% of the population of England. Last year, however, the number in Northumberland dropped from 200 to just 40. According to the latest figures, the number completing an apprenticeship in the same fields across England dropped from 16,100 during 2011/12 to 5,400 in during 2012/13 (a fall of 66%). The decline in Northumberland was even more dramatic. A fall from 200 to 40 equates to a fall of 80%. 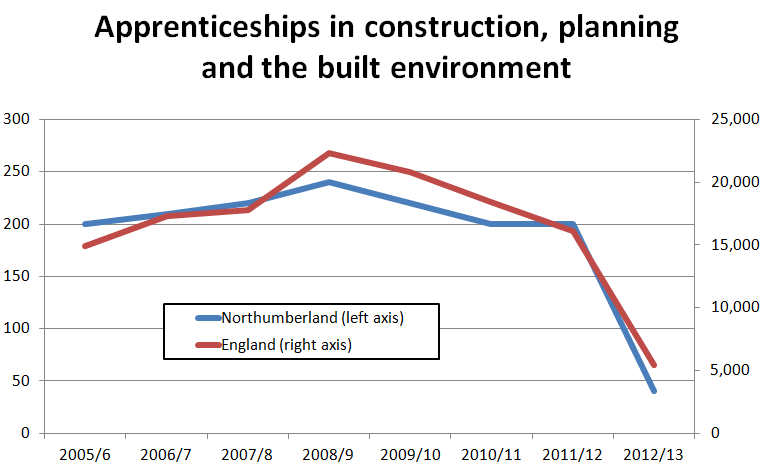 The number starting an apprenticeship in Construction, Planning or the Built Environment in Northumberland has also fallen, but not by the same proportion (from 280 to 100). So it looks as though the drop in those qualifying is partly due to fewer apprentices starting, but more about the number who start their apprenticeship but do not go on to complete it. What this means for individual apprentices is hard to say. At county level Northumberland has lost its edge. It now contributes about 0.8% of all England’s apprenticeships in Construction, Planning and the Built environment. This is roughly in line with the overall number doing apprenticeships , and more than a fair share measured by population size. In brief, this drop in numbers looks even more worrying at a local level than it is at a national level.